The Beolit 600 was the first in a new range of portable radios that formed the basis for the final series of Beolit models. The styling borrowed certain cues from the previous Beolit 1000, though the new 600 was a smaller and lighter set with fewer features. Text copyright © Beocentral. Unauthorised reproduction prohibited. The casework of the Beolit 600 was slim and elegant. The central section was faced on all sides, including the bottom, with brushed aluminium. The tuning scale and all controls were placed on the top, whilst the bottom plate could be slid sideways to release the rear cover for replacement of the 5 “D” sized batteries. The front and rear covers could be easily changed without the use of tools, and different colours were available to suit the owners taste. All were of coloured moulded plastic, the luxurious hardwood and leather finishes of the previous models were not available for the Beolit 600. The design of the scale and controls was very similar to that of the larger Beomaster models of the period, with long straight lines and slim sliding controls. The tuning dial was novel, using ball bearings running in Perspex covered channels to act as a pointer. These were linked to the tuning cursor by a strong magnet inside. The cursor itself had two thumbwheels which could be used for fine adjustment of the tuning. Both AM and FM bands were covered, and in one version MW and LW were available, while in another these were replaced by 2 SW bands. The SW model had an extra “fine tuning” control mounted next to the rod antenna labelled “SW expander”. 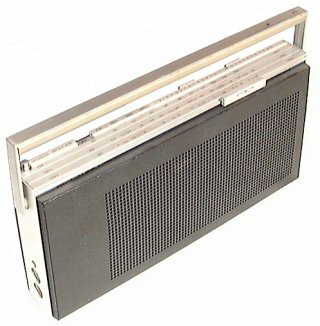 The MW/LW model included a built-in ferrite rod antenna, whilst both versions featured powerful AFC for FM. Text copyright © Beocentral. Unauthorised reproduction prohibited. Connections were provided for a extra loudspeaker, a record player or tape recorder (which could be played through the Beolit’s amplifier and loudspeaker by pressing two of the band selector switches at once) and an external power unit. Unlike the Beolit 1000, there was no advantage, other than a reduction in battery costs, to using the external power unit, output was fixed at about 1W. The output stage was of a new design and was the first in a Beolit to operate in a “transformerless” configuration. Text copyright © Beocentral. Unauthorised reproduction prohibited. Although the introduction of the Beolit 600 marked the simplification of the portable range, which went from offering a wide range of different models to a choice of different versions of basically the same model, it proved very popular and sold strongly. The basic style and shape continued to be available throughout the 1970s. Text copyright © Beocentral. Unauthorised reproduction prohibited.